[Jesus prayed,] "Now I am coming to you. I told [my disciples] many things while I was with them in this world so they would be filled with my joy." 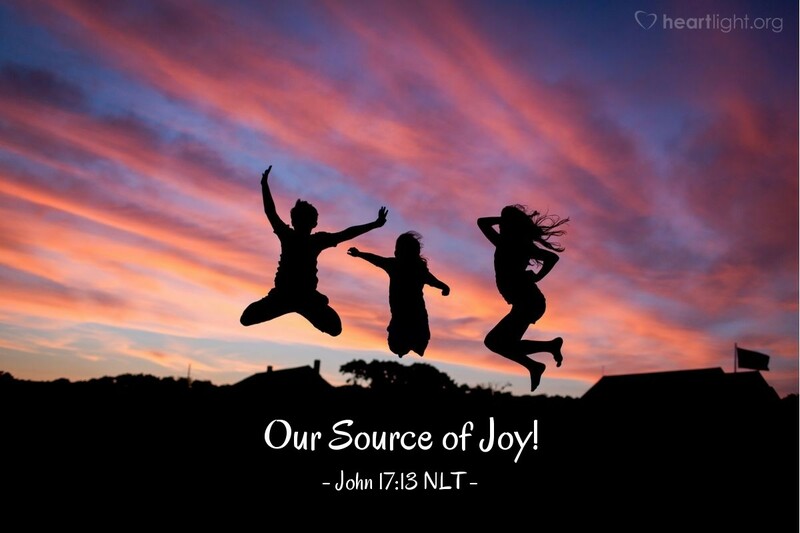 Jesus is our source of joy! The apostle Paul said it this way, "Always be full of joy in the Lord. I say it again — rejoice! Let everyone see that you are considerate in all you do. Remember, the Lord is coming soon" (Philippians 4:4-5). From his birth to his resurrection and to his coming again to take us home, the Lord is our source of joy. He has shown us God's great love for us. He has taught us how to live victoriously in a hostile world. He will never forsake us or leave us. He has ensured that death cannot sever us from his love. He has promised that he will return and bring us home with him. Jesus is our source of joy. Like the prophet Nehemiah reminded us so long ago, "The joy of the LORD is your strength!" (Nehemiah 8:10b). Father God, sovereign master of all creation, thank you for giving me the one true source of joy that cannot be extinguished or exhausted. Your gift of Jesus has brought me hope, salvation, and JOY! Please receive my undying gratitude for a reason to rejoice even in earthly life's most painful moments. I pray in the name of Jesus, my source of joy. Amen.